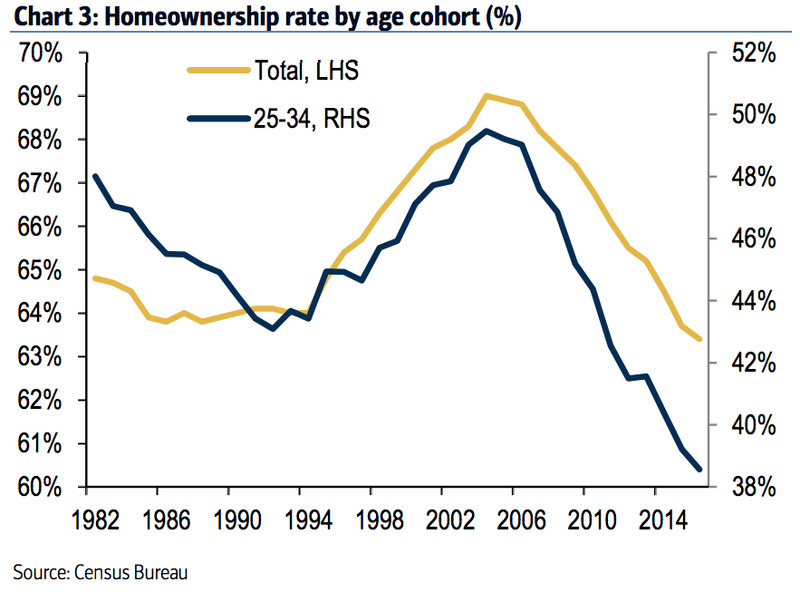 Millennial homeownership in the US is at a record low. The age range of millennials — Bank of America Merrill Lynch economists used 25 to 34 — is usually prime time for purchasing a first family home. 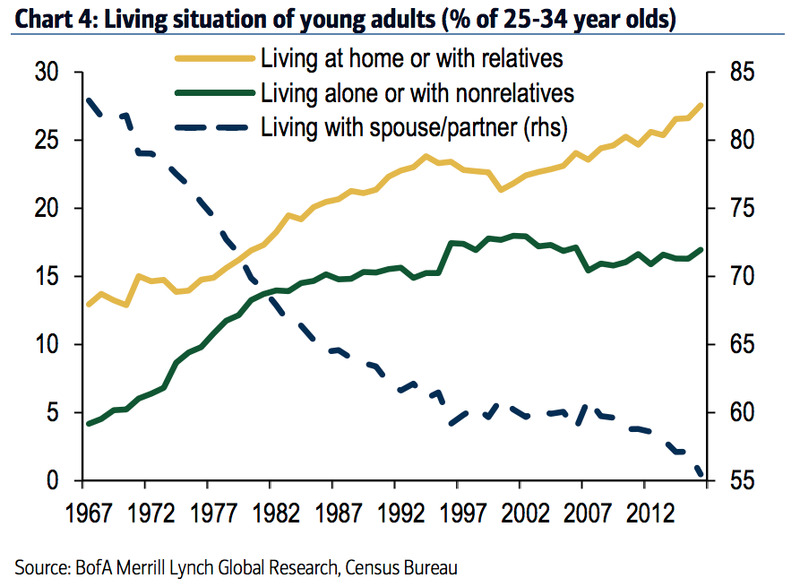 That demographic factor is one reason why some housing economists are bullish on demand. However, the data has not yet caught up. “We believe the delay in homeownership is due to tighter credit standard and lifestyle changes, including delayed marriage and children,” wrote Michelle Meyer, a US economist at BAML, in a recent note. The following charts illustrate some of these factors. 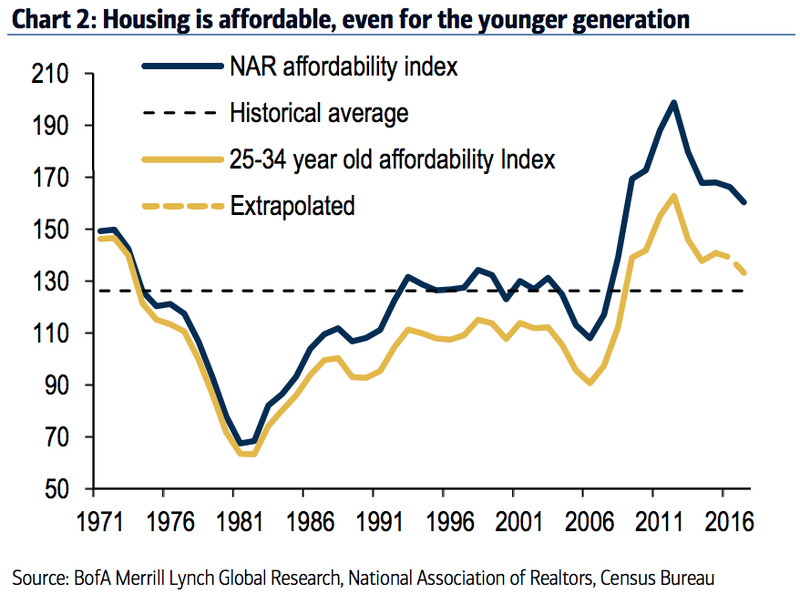 Housing is less affordable for millennials compared to the overall population. The National Association of Realtors computes an affordability index by comparing the median home price to the median family income. That way, it gauges whether a typical family can qualify for a mortgage loan in a particular region. Although housing is affordable for millennials by this aggregate measure, it’s lower than for the rest of the population whose work experience means that their incomes are likely higher. The big obstacle for young people is making a down payment, which the NAR assumes as 20%, Meyer said. The record level of student debt also makes it hard to take on a mortgage loan. 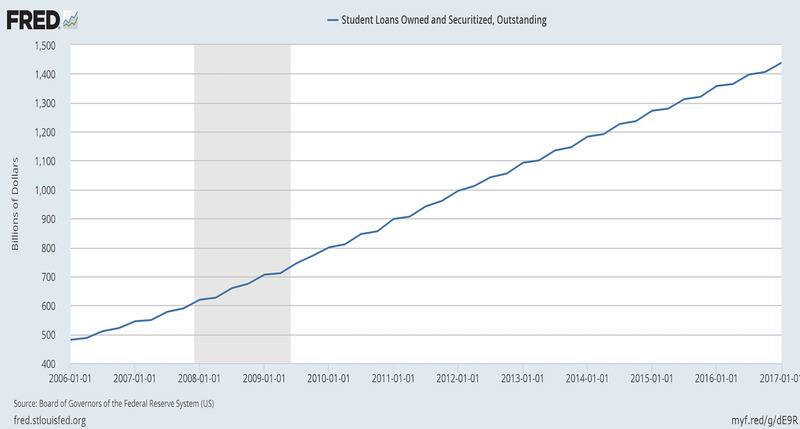 There was $1.44 trillion in outstanding student loans at the end of the first quarter, according to the Federal Reserve. It’s not only about affordability. The millennial homeownership rate has fallen at a faster rate than other age groups. 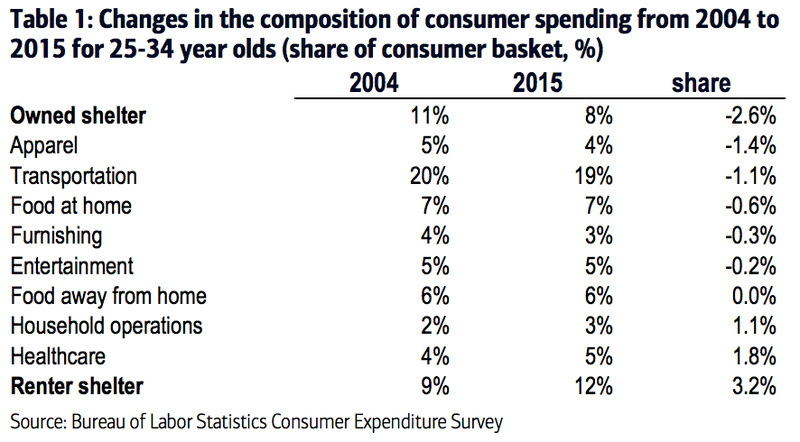 The share of spending on renting increased in the decade through 2015 while spending on owned housing fell, according to the Consumer Expenditure Survey. …and are more likely to live with their parents. Data from the Census Bureau show that 55% of 25 to 34-year olds live with a spouse or partner, compared to 80% in 1967. 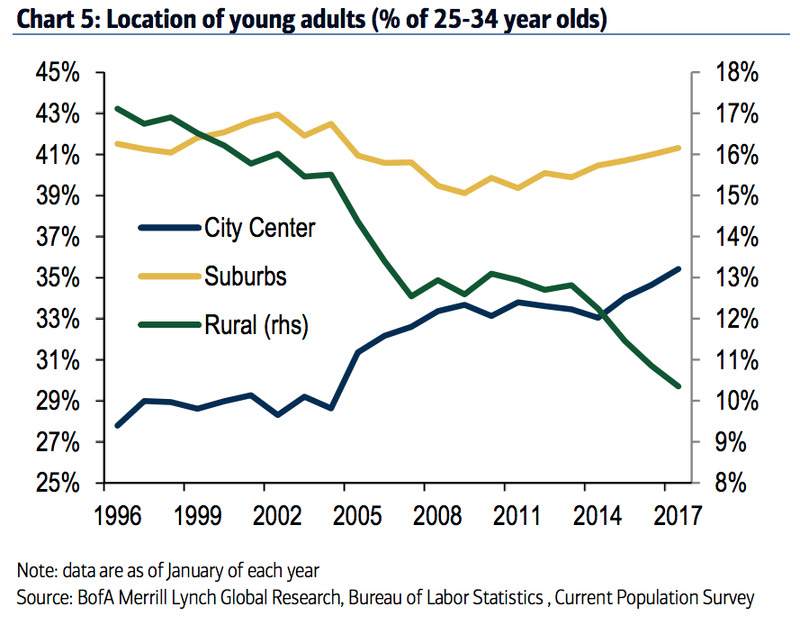 Millennials appear to be flocking to city centers. “According to BuildZoom, new home sales within 5 miles of the centers of the 10 most densely cities have exceeded 2000 levels but if you go another 10 miles out, sales are about 50% below 2000 levels,” Meyer said.